World Archeology: Could newly discovered ancient stairs lead to more treasures under Vishnu Temple? Could newly discovered ancient stairs lead to more treasures under Vishnu Temple? Archaeologists have unearthed a set of three ancient granite steps and building foundations near the northern entrance to the Sree Padmanabhaswamy Temple, located in Thiruvananthapuram, the capital city of the State of Kerala in India, according to reports in the New Indian Express. The temple, which is dedicated to Lord Vishnu, is famous for its underground tunnels and the billion-dollar treasure uncovered in its secret vaults several years ago. “The basement made of brick and laterite stone could be part of the temple complex in the past,” said Archaeology Department director G Premkumar. Even after three years since the world came to know about the billion-dollar treasure trove in the secret vaults of Sree Padmanabhaswamy Temple, the network of underground tunnels leading to the temple complex still remains a mystery, and many are concerned that the state police have not shown any interest in monitoring the subterranean passages in the temple complex, which are clearly a security risk to the priceless treasures laying beneath the temple, as some of the passages may still be functional. Historians say that the tunnels were built between 12th century and 18th century, during which time the Travancore Kingdom, a former Hindu Kingdom ruled by the Travancore royal family, faced threat from various quarters, including the Mughal invaders, the Dutch and the British East India Company. 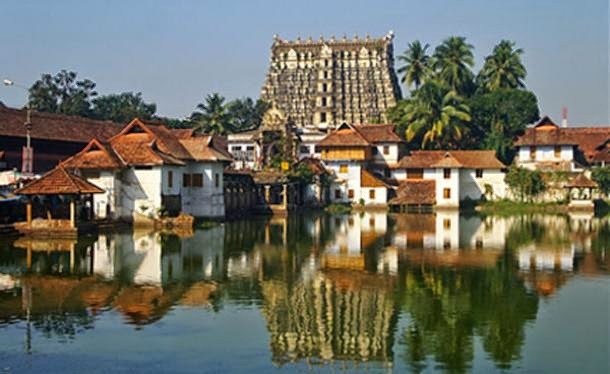 The history of the Sree Padmanabhaswamy Temple dates back to 8th century. 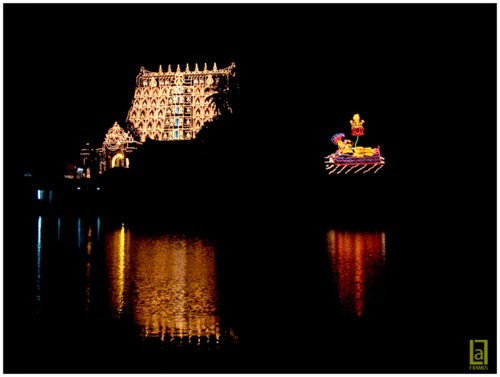 It is one of 108 sacred Vishnu temples or Divya Desams, the holiest abodes of the Lord Vishnu that are mentioned in the works of the Tamil Azhvars (saints). The presiding deity of this temple is Lord Vishnu, reclining on Anantha, the hooded Serpent. 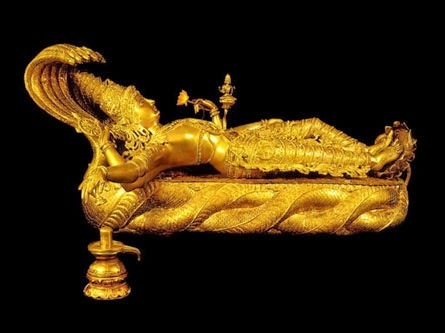 The 32 kg, solid gold statue of Lord Vishnu reclining on Anantha, the hooded Serpent. Photo source. In 1750, Marthanda Varma, one of the Travancore kings dedicated the kingdom of Travancore to Lord Padmanabha. Marthanda Varma vowed that the royal family would rule the state on behalf of Lord and he and his descendants would serve the kingdom as Padmanabha Dasa (the Servant of Lord Padmanabha). Since then, the name of every Travancore King was preceded by the title Padmanabha Dasa. Local legend spoke of immense riches sealed within the thick stone walls and vaults of the temple by the Travancore kings, and the stories were right. Several years ago, researchers uncovered a remarkable collection of treasures valued at an incredible US$5.3 billion. The treasures include thousands of gold coins, rare valuable gems, precious diamonds, 1,200 gold chains, gold crowns, 400 gold necklaces, more than 2,000 gold ornaments, gold plates, gold chains weighing up to 10.5 kilograms and measuring 18 feet in length, the golden idol of Padmanabha Swamy, 4-foot-tall golden statue of Lord Vishnu studded with precious emeralds, gold staffs, gold utensils, gold umbrellas, 2,500 gold pots and numerous golden rings. 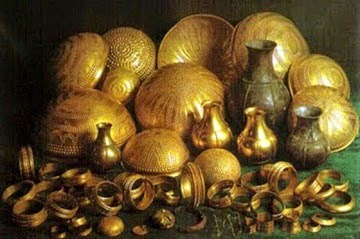 A tiny fraction of the solid gold items found in the vaults of the temple. Photo source. The discovery of the treasures solidified the status of the Sree Padmanabhaswamy temple as one of the wealthiest temples in India, and the question has been raised as to whether the newly discovered stairs could lead to yet more treasures under the ancient temple. READ ALSO: Ancient UFO Discovered Under Temple in India.